Karin was born in New York City and moved with her family to Mankato at the age of six. She is a first-generation American as her parents were both born in Estonia. She speaks fluent Estonian and has also studied German and Spanish. 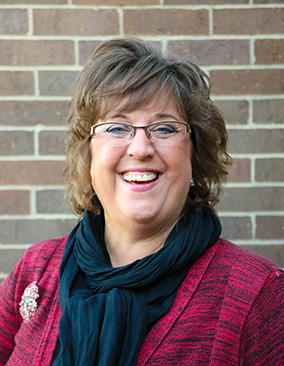 Karin graduated from Mankato East High School and Mankato State College with degrees in Therapeutic Recreation, Special Education and Adaptive Phys-Ed, with graduate studies in Vocational Rehabilitation Counseling. She worked at REM for five years prior to joining Harry Meyering in the Semi-Independent Living Services program in 1981. She describes her 35 years with Harry Meyering as challenging and rewarding with continuous personal and professional growth. Karin is married, has a son and daughter and adores her role as a grandmother of Eli and Emery. In her spare time she enjoys gardening, decorating, entertaining and socializing with family and friends. She loves the symphony, traveling, going to the park and enjoys going to the YMCA for relaxation. She describes her parents as her ‘heroes’ because they survived many obstacles and challenges in their lives and encouraged and reminded her that you can do anything you set your mind to. Her favorite words to live by include the Golden Rule—Do unto others as you would have others do unto you—and a quote from Ghandi, “Be the change that you wish to see in the world”.